From “American Biographical History of Eminent and Self Made Men of the State of Michigan”. 1878. Facing page 31. Western Biographical Publishing Company (Cincinnati, OH), publisher. On this date 150 years ago, former Territorial Supreme Court Justice Henry Chipman died in Detroit at age 82. He is buried in Elmwood Cemetery in Detroit. Henry Chipman was born on July 25, 1784, in Tinmouth, Vermont. His father, Nathaniel Chipman, was a well-known judge, U.S. Senator, and legal writer of his day, and Henry read law with him after graduating in one of the first classes from Middlebury College. 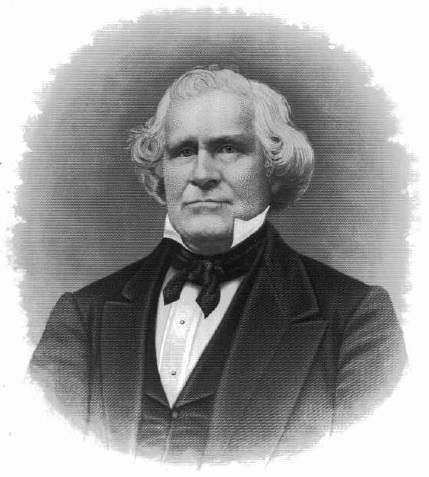 While at Middlebury, Henry and his friends founded the Philomathesian Society, a debate society that argued important subjects of the era, including the slavery debate and scenarios that would arise in the event of a Civil War. For his health, Henry moved to Jamaica, and later South Carolina, where he married and ran a law practice in Waterborough from 1809 to 1824 (with a six-month exception for military service during the War of 1812). The family moved to Detroit in 1824 because they wanted to live in a state without slavery. A committed Whig, Chipman wrote for the Morning Herald and later founded the Detroit Daily Advertiser. In 1825, Chipman was appointed chief judge of the Wayne County (Criminal) Court. President John Quincy Adams gave Chipman a recess appointment to the territorial supreme court on July 18, 1827. Because of his Whig politics, President Andrew Jackson did not re-appoint Chipman to the Court in 1832. He returned to private practice in Detroit and served on Wayne County’s Criminal Court from 1841-1844. After he retired from law, he continued to write for newspapers. –Compiled from the Michigan Supreme Court Historical Reference Guide, 2d edition. Purchase this book here.